Restylane is a dermal filler designed to reduce facial lines and wrinkles, rejuvenate the skin and enhance facial volume. Restylane is one of the most popular dermal fillers because it provides a natural look that lasts. 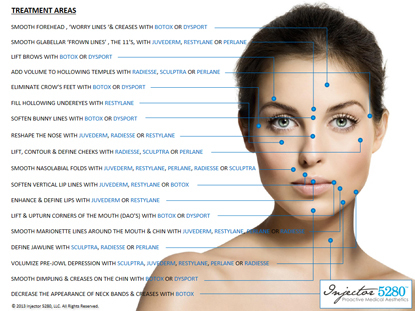 Restylane is comprised of hyaluronic acid, which is a sugar molecule produced naturally by our bodies. Hyaluronic acid binds to water, acts as a lubricant and gives our skin fullness and hydration (individual results may vary). Restylane improves the signs of aging by restoring volume and smoothing facial lines and wrinkles. Restylane is slightly different from other dermal fillers due to its higher concentration of hyaluronic acid. Injector 5280 in Denver believes this makes Restylane one of the best dermal fillers for correcting moderate to severe wrinkles and enhancing the lips (individual results may vary). Which Areas can Restylane be Administered? Smoothes and softens the appearance of fine lines, folds and creases on the face, especially around the mouth and smile lines. What Preparation is needed for Restylane? There is very little, if any, downtime or recovery needed. You can resume most activities right away. Unless otherwise advised by your Aesthetic Injector, do not rub or massage the treated areas so the filler can remain undisturbed. Restylane injections, just like any other injection, can cause some bruising and swelling. We have some special techniques that we use to minimize the swelling and bruising associated with Restylane injections. However, if bruising and swelling occur it will subside and fade. Some mild redness is normal after the procedure and should diminish in 60 minutes. Make-up can be applied 15 minutes after treatment. If you experience any mild aching at the site of injection after the procedure this can easily be controlled with Tylenol. Immediately after the treatment you will see an increase in volume and a smoother appearance. Results will continue to improve over the next 48 hours. Your body will naturally acclimate to the hyaluronic acid and the product will bind to water, producing a fuller appearance (individual results may vary).